El Yamaha TSX-100 dispone también de una entrada auxiliar para conectar cualquier fuente externa y poder así, reproducir archivos de audio a través de dos altavoces de 12 vatios. El nuevo modelo de Yamaha cuenta además, con tecnología twin SR-Bass. Por otro lado, el TSX-100 está dotado de sintonizador de radio FM y reloj despertador. Tanto las funciones del reproductor TSX-100 pueden controlarse desde el mando a distancia que incluye. Sistema CD/Radio/Despertador. Entrada auxiliar. Oferta hasta agotar existencias. The music you want, whenever you want it!The TSX-100 makes it easy to enjoy high quality music all day long. 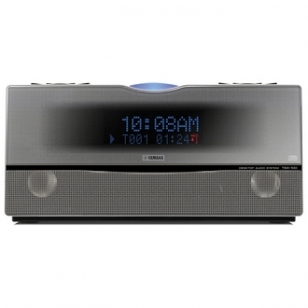 Set the timer to wake you up with lively tunes or your favorite radio station. Then take it into the kitchen for some music with your coffee. Enjoy background music throughout the day by selecting from among various music sources.You'll always have a clock handy, too. 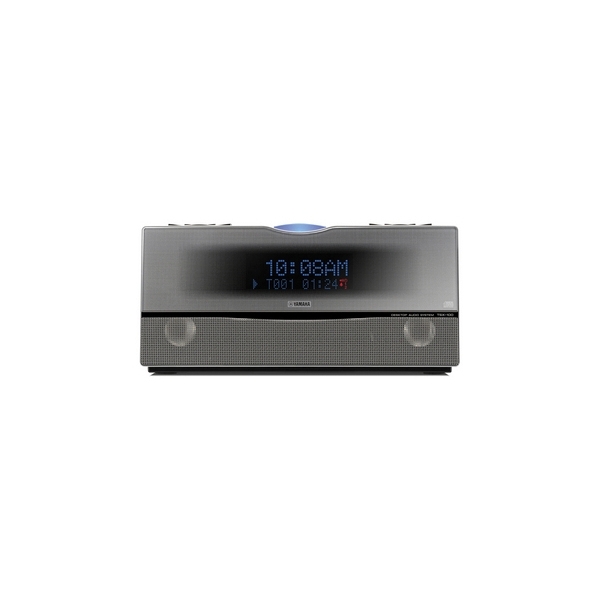 In the evening, pop in your newest CD, then listen to the news or sports, and finally set the timer to lull you to sleep with some gentle music.Your day has had a perfect soundtrack…thanks to the TSX-100. Sound Quality that Does Justice to the MusicYes, it's convenient, but how does it sound? The answer: amazingly good. Precision waveguide technology takes the small initial sound vibrations and extends them, producing strong sound energy that is output from independent left and right speaker boxes. You hear 20W of rich, full range, stereo sound. What's more, Yamaha engineers fine-tuned the system to emphasise precision and clarity, so you hear every musical detail and there's no harshness to cause listening fatigue. Twin SR-Bass for Deep LowsJust because it's compact, doesn't mean we left out the bass. Both speakers have an SR-Bass (Swing Radiator Bass™) diaphragm on the side for deep, crisp bass that really enhances the sound. Play CDs and MoreYou can listen to ordinary CDs and also recordable CDs with MP3 or WMA files. A stereo mini jack lets you connect portable audio devices and there's also a dedicated iPod dock terminal. You can charge your iPod.and iPod song titles display in English and Western European languages ISO 8859-1 (Latin1) on the front panel. Sound the Way You Like ItUse the bass, treble and balance controls to set the sound output you want and choose from among four equalizer modes to best match the music. FM/AM RadioYou can enjoy digital audio broadcasts and preset 30 FM and 20 AM stations for quick onetouch tuning. US and Canadian models have XM Satellite Radio tuning capability (XM ready), too..
Wake Up, Snooze, SleepYou also get three timer functions. An alarm with two settings (handy for couples), a five minute snooze, and a sleep timer. Dimensions (W x H x D) 11-13/16" x 5-9/16" x 7-7/8"